Whew! I don't know about you, but I'm pooped! 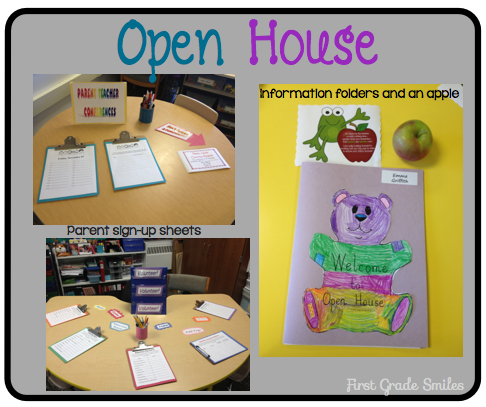 We just ended our first month of school and it has been a whirlwind of SLO's, testing, teaching routines, and this past week was Open House. I'm sure I'm not the only who is on overload right now. So here is a little about the last week or so (since I haven't had a second to pay attention to this little blog). First up, since it's so fresh in my mind is Open House. 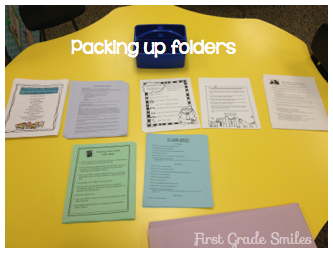 I had to go in late one evening this last week after my kids went to bed to pack up the folders for the parents. There's just no time during the normal day. Am I the only one who does this? 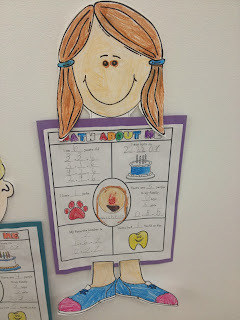 In each folder I include a classroom informational packet that is specific to our class, a curriculum overview from our district, a list of helpful websites, and some ideas for how parents can help their children at home. Some of these handouts are older, but if you see something and you know where it came from please let me know so I can give them credit. 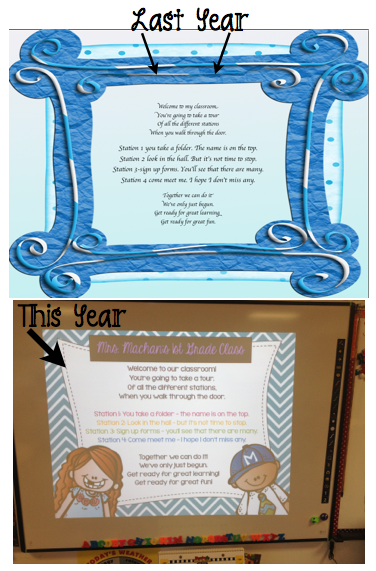 I also had to spend a little time improving the poem I project on my board. 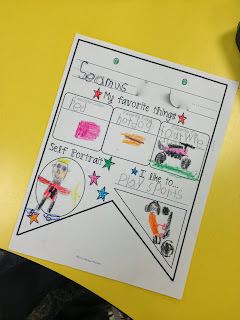 This is just a poem that I made to help parents get to all the things we do. I'm almost a little embarrassed to show you the one I used last year. I think this year's was WAY better (thanks to Melonheadz of course!). But here are a couple pictures of what it looked like. I also can't find the person to credit for the apple poem - would love to know who it is. The bear on the folder was given to me from the wonderful teacher who retired before me so it's been around a while. My next order of business was to make sure my bulletin boards and displays were ready to go. 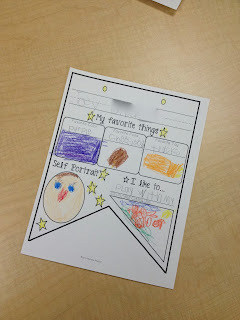 First up was our All About Me banners. 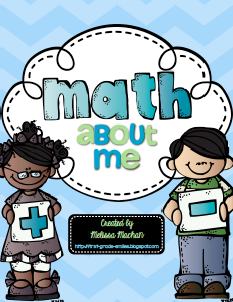 We also do a Math About Me craftivity (which is a freebie in my store). 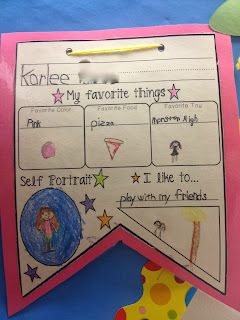 This picture is from last year because I forgot to take a picture of it this year. This is a shared bulletin board with my teammate. 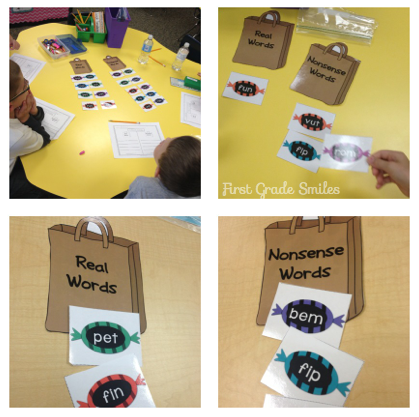 We wanted to tie in Character Ed and keep it simple. 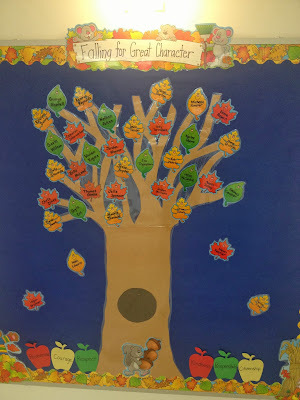 The students' names are on the leaves (both classes) and our character ed words are on the apples at the bottom. 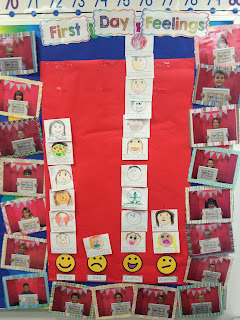 And finally, in my room I added the students First Day of 1st Grade photos to our First Day Feelings graph. I don't love the way it looks, but it was a quick one to throw together with little room to work with. 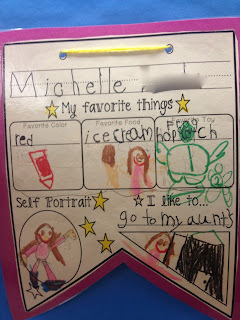 Outside of Open House, we've actually been doing some learning too! Imagine that! We've been working hard at getting our center routines down. 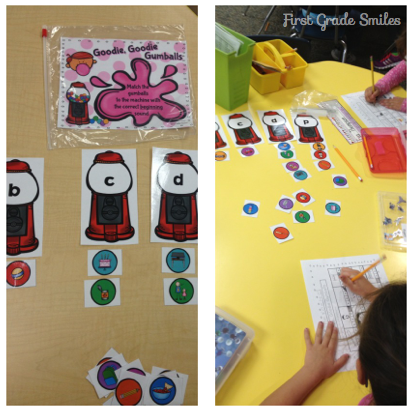 We started with these Sweet Centers, which were relatively simple concepts to get them going independently. 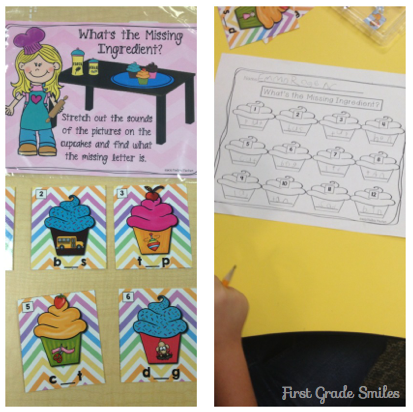 These are from my pack of literacy and math centers: Pour Some Sugar On Me. Any Def Leopard fans out there???? 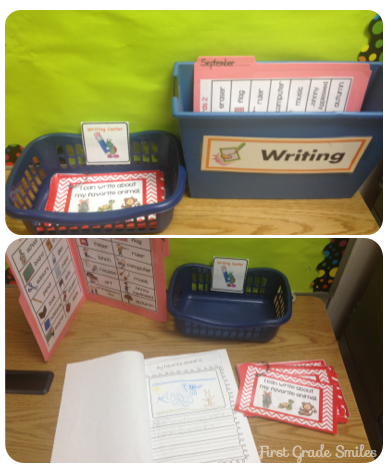 These pictures are just showing the literacy centers. 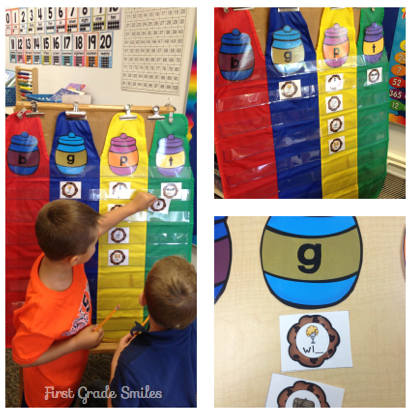 I will be posting the math centers soon. 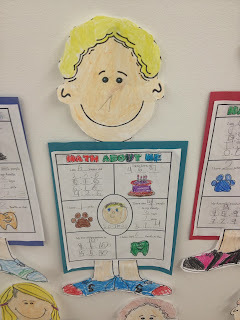 We are just getting into our guided math and math tubs. 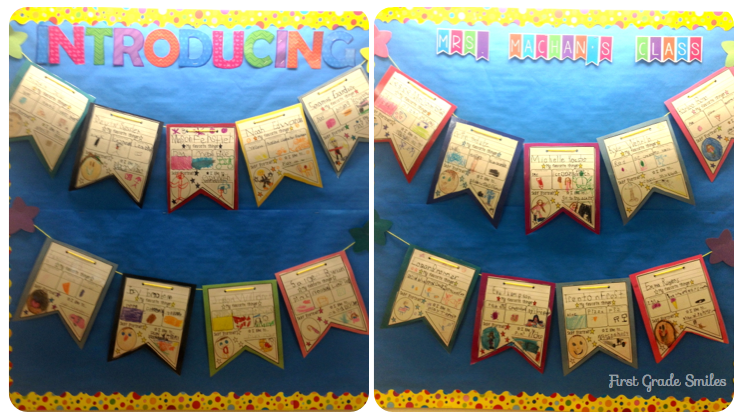 We also started our writing center, which is going really well and the kids LOVE it!!!! 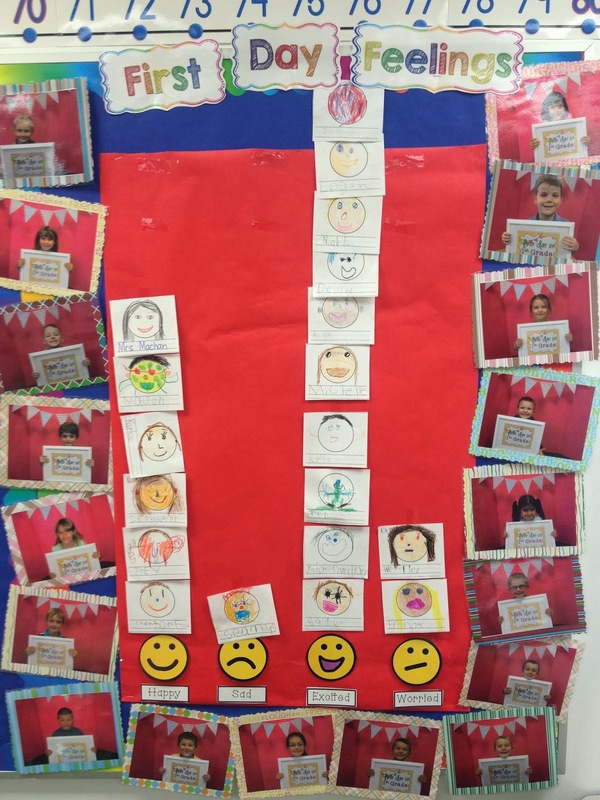 This shows our September task cards and journals. 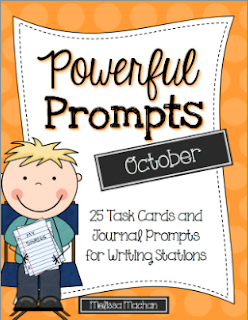 If you are looking for some prompts for your writing center or station, check out my October pack. I am also finishing up a little Apple Math pack and would love any ideas. 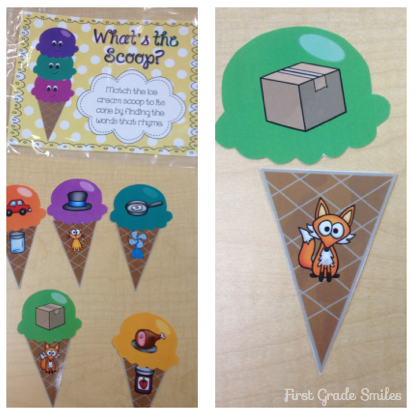 Right now it focuses on combinations of ten and includes a center that matches pictures with number sentences as well as a student book. Should I stick with just combinations of 10 or expand into other concepts?? ?